Preheat your oven to 425 degrees. 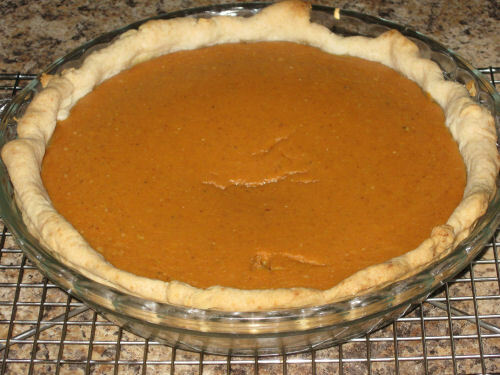 Set the pie plate aside. 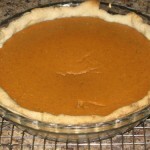 In a large bowl, whisk all the other ingredients together, pour into the pie crust and bake for 15 minutes. Without opening the oven door, reduce temperature to 350 degrees and bake for 40-45 more minutes or until a knife inserted about one inch from the crust comes out clean. Set on a rack to cool. Serve warm or cold. Hello! I made this pie for my girlfriend and family this weekend. It didn’t take more than 5 minutes to prepare and came out *AMAZING*. I love your site. Thanks!!! I’m back 4 years later to get this recipe again. I’ve made it every year at Thanksgiving and Christmas. THANK YOU!